We hope that you enjoyed the holiday season and are off to a great start in 2018! 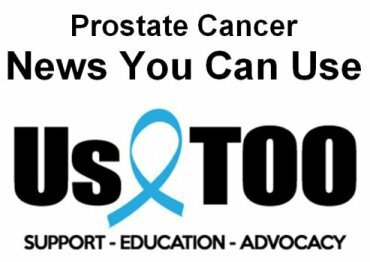 Titles of recent Prostate Cancer News You Can Use articles are listed below followed by a link to the Us TOO web page that provides access to the full text. We thank everyone who donated to the Us TOO Holiday Hope campaign , which generated funding for the educational resources and support services provided by Us TOO at no charge. We’d also like to send a special shout out of thanks to support group leaders and others in the community who shared a quote or story of hope for the fundraising campaign ( CLICK HERE). If you’d like to start a new Us TOO support group or see a video message from current support group leaders who explain the “give & get” of volunteering to lead a support group CLICK HERE. If you’d like to find an Us TOO prostate cancer support group CLICK HERE. As we begin the New Year, Us TOO is excited to be partnering with Imerman Angels to provide additional peer-to-peer support services to the prostate cancer community: http://www.ustoo.org/One-on-One-Support. We will continue to provide the toll-free Us TOO Prostate Cancer HelpLine 1-800-808-7866 (1-800-80-US-TOO) to answer questions and connect callers to response team volunteers who had a similar treatment or side effect. In addition, we invite you to register for the free services from Imerman Angels with support from experienced “Mentor Angels” selected based on criteria that includes age, gender, lifestyle, and cancer experience. CLICK HERE to read the press release announcing the partnership. We also encourage you to check out Cancer.com – a new online resource that features cancer information categorized by topic . Content is tailored to each visitor based on cancer type (including prostate cancer) and the various points in the cancer journey. It offers a wealth of resources, including an exclusive digital health coaching tool developed by Johnson & Johnson behavior scientists that aims to pave a path to better health outcomes. Janssen Oncology built, and continues to develop, Cancer.com through close collaboration with trusted and leading members of the oncology community. Watch for the February 2018 issue of the Us TOO Hot SHEET newsletter later this month. Take care, stay warm and let us know how we can help you with prostate cancer educational resources and support services.